Product Description: The phone features a full color screen and allows for up to 4 calls to be made with the phone at once. The phone rests in a charging doc when not in use and the battery has up to 10 hours of talk time or 100 hours of standby per charge. A wireless signal of 50 meters indoors, gives you a good range of motion from the base station while maintaining connectivity with the phone. The base station for this phone supports up to 8 handsets, and has Power Over Ethernet (PoE) capabilities so you can connect it with just an Ethernet cord, or you can can used the included power supply. 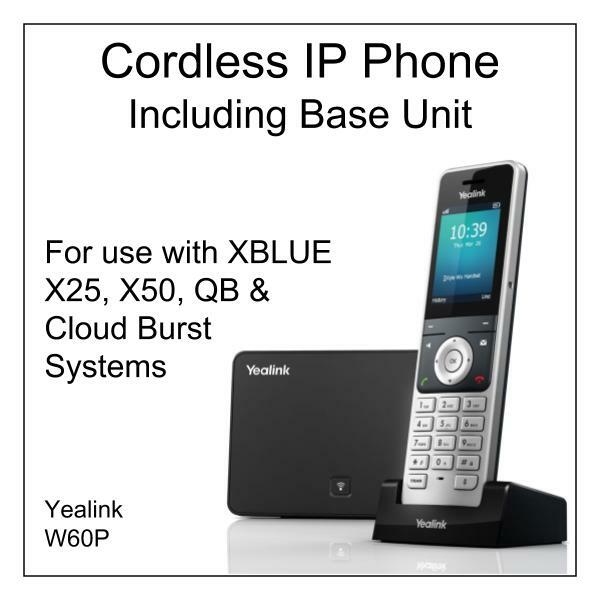 IP End Point Provisioning: When purchased from XBLUE.com, the XBLUE IP End Point Provisioning fee is included to integrate this product with your XBLUE phone system. XBLUE Support: When you purchase this product on XBLUE.com you receive free technical support from XBLUE to help you set it up for use with your XBLUE system. To receive this valuable service just contact us at 866-925-8312 or click here to send us a message. To provide support all we need is your XBLUE.com order number.